Portals, this web edges, and gaps are recurring themes in Leslie Dunsmore’s paintings—the tantalizing spaces between tree trunks in a forest, the dangerous-but-exciting edges of cliffs, the evocative darkness of caves and crevasses. And every painting, she says, has a pathway that draws the gaze into the heart of the image. Those same themes—portals, edges, gaps and pathways—have marked Dunsmore’s journey as an artist. Though she didn’t grow up thinking of herself as artsy, didn’t study art at college, and headed off on a series of entirely unrelated career paths, she is now, in her mid-60s, a full-time visual artist with a busy schedule of shows and a steady output of paintings—approximately 15 to 20 annually, many of which sell throughout the year. Dunsmore is one of more than 20 artists featured in the Denman Island annual Studio Tour on August 18 and 19. Visitors can linger in her light-filled Denman Island studio, view dozens of her paintings, take a peek at her celebrated garden (she’s been on the renowned Denman Home & Garden Tour numerous times), and talk to her about her creative process, the intriguing titles of her works, and the ins and outs of life on this abundantly creative Island. Dunsmore traces the birth of her artistic sensibilities to her free-spirited mother… and a pathway. Although Dunsmore didn’t know it at the time, she was learning how to play, how to break or ignore rules in the pursuit of aesthetic splendor, and how to step through portals into the potent unknown. Dunsmore enjoyed making art, but in spite of her mother she headed into adulthood thinking of herself as rational and scientific. She studied science and education at university. A chance encounter in her early 20s opened a portal to the world of art. Dunsmore had taken an administrative job in a remote community in the far North, lured by the generous pay. Sketching was an enjoyable way to pass the time and connect to the bleakly beautiful Arctic landscape. One day Dunsmore was sketching out on the tundra when a shadow fell over her sketchbook. She turned around to find a stranger looking at her work. This man was a British engineer working on a contract for a mining company. He was also an artist and lover of art. A month later Dunsmore’s mentor returned, and was impressed with what he saw. He continued to nudge Dunsmore along her artist’s path, giving her feedback, introducing her to ideas, and recommending books. “There were no computers back then. We had to order books from the library in Winnipeg, 1,000 miles away,” says Dunsmore. Six months later when the engineer left, he told her that she needed to be an artist and gave her all his art supplies. That was a good thing, because Dunsmore was hooked on art. “Those were my first two inklings that doing art was a joyous experience,” she says. Dunsmore has been producing art ever since. She never did get to art school in a formal way, but instead found inspiration and education by following her own adventurous path, while working full time as a public administrator, mediator, bee-keeper and teacher. “I’m a bit of a gypsy and have been in a quite a few places around the world,” she says. “In every city I spent time in when I was younger, I’d book into a night class. I have three favorites. In London, England, I took a five-month course in the elements of design and composition. It completely opened my eyes! I learned to look at a drawing or painting and figure out what didn’t work and how to make it work—maybe the problem is the horizon line is right in the middle, or the whole thing should be just what’s in the top right hand corner. Not long after her Italian adventure Dunsmore started to feel that she was pushing up against an edge. She wanted more art in her life. She was tired of earning an income full-time at one thing and trying to fit in painting on the side. Being a resolutely practical person with a mortgage to pay, she was skeptical of such a seemingly irrational idea, and spent about five years letting this desire—more art! less work!—roil around in her brain. She’d travelled along pathways, stepped through portals, but she wasn’t ready to go over the edge. And nothing was what she did—not even painting. She allowed herself to experience something she often includes in her paintings: a gap, a still space, a pregnant pause. For the first time since childhood she didn’t have a plan for each day. She spent hours just sitting, looking at the world around her and the world inside of her. Going over the edge proved not be so scary after all, perhaps because Dunsmore did not abandon her rational side in the process. “I knew I couldn’t simply paint beautiful things and expect that people would somehow buy them. I very consciously went about using the administrative skill set I’d developed. I took two highly effective workshops in Vancouver on marketing. Boy, did that open my eyes! When I got back I sat right down and over two intensive weeks created a thorough business plan,” she says. Engaging her ‘left brain’ capabilities—organizing and marketing—to help her ‘right brain’ artistic nature has allowed Dunsmore to finally do what she loves best full time. One of Dunsmore’s favorite ways to market herself is to bring people to her lovely island home. Not only does she take part in the Denman Island Studio Tour every year (see box), she’s hosted her own annual weekend event in early July for the past eight years, The Garden of Lilies Art Show. Visitors are invited to spend time in her mature hillside garden, which boasts more than 500 lilies as well as many other ornamental and edible plants, and to enjoy the art hung in her studio and ocean-view home. 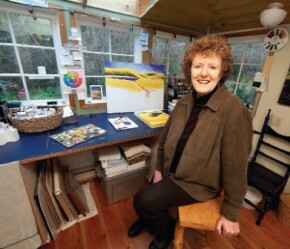 When Dunsmore moved to Denman Island in 1975, she didn’t realize it was on its way to becoming an artists’ colony. She fell in love immediately with the beauty of the Island and only later came to realize she’d landed in a community full of creative people. Dunsmore’s paintings are not easy to categorize. They present scenes in nature; there are often bold, vibrant, warm colors but sometimes there is darkness and melancholy; they appear realistic, and yet there are purple trees and ghostly forest-scapes that seem to come from the world of dreams. “You look at one of my paintings and you know you’re in a marsh, on the top of a mountain or the side of a sand dune, but it’s not entirely realistic. A sense of place is being defined but then it evokes something internal, something personal in the viewer’s psyche. The silence Dunsmore is speaking of is not “dead air” type silence—it’s the profound, numinous, full-of-power silence that spiritual traditions speak of. Dunsmore recognizes this. “Making art gives me what other people get from yoga and meditation,” she says. Dunsmore has a clear sense of the power of art—not just for herself but for the world. This is not the only example of art changing history, she points out. And today, with the earth facing so many threats, we need art more than ever. On August 18 and 19, more than 20 Denman Island artists will open their studio doors to the public for the Denman Island Studio Tour. This free event offers a rare glimpse into an artist’s creative space, giving a sense of their process, their inspiration, their inner life, and the roots of their creativity.